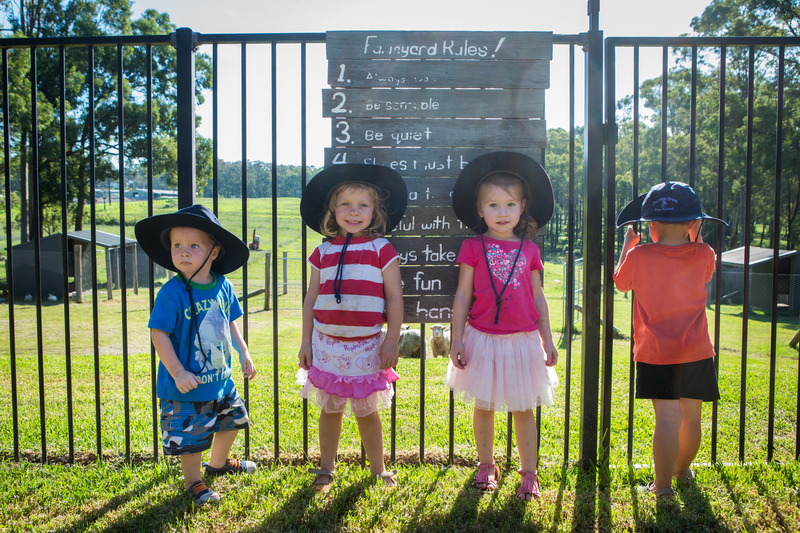 Welcome to Jacaranda Grove Pre School. At Jacaranda Grove we strive to provide an Educational nurturing and homely place for your child to learn and grow. At Jacaranda Grove our aim is to foster each child’s individual talents, abilities and development to allow them to reach their full potential. Our physical environment is designed to encourage all children to participate in all areas of the Learning Framework and develop in them an understanding of their natural environment. Quality Early Childhood Educators, a curriculum of play based learning, intentional teaching strategies and a huge environment with small group sizes, makes Jacaranda Grove the perfect place for your child to grow, develop and reach their full potential, preparing them not just for school, but for life! Part of our Preschool curriculum incorporates a farm yard, we have chickens, sheep, alpacas and will hopefully soon we will have goats. We believe animals bring another element to our centre allowing children to experience the enjoyment and responsibility animals bring. Our yard is big with lots of natural grass allowing children the room to run freely and enjoy movement activities and pockets of the outdoor environment allow quiet and focused play for those who want to play quietly with their friends. Being so fortunate to have lots of space around, enables us to implement a 'bush kindy' aspect into our centre. We take advantage of our surroundings and take small groups (sometimes the whole group) on bush walks on the adjoining 23 acres. We have some logs in our 'secret garden' where we can stop for a picnic lunch or snack, play some games of hide 'n' seek or just find some nature items to bring back to Pre School to for craft or loose parts play. Integrating our ‘bush kinder’ approach allows children to develop skills sometimes un achievable in the classroom setting. Positions are available now for ages 2yrs to 6years for 2019. If you are interested in a position either for 2019 or in years to come please complete a waiting list form online which will be filed in date order, alternatively please feel free to come in and have a look around, get a feel for the place and fill in a waiting list form while you’re in. We look forward to meeting you soon. If you have any queries in the meantime please call Sheree 0403479715. Jacaranda Grove is a wonderful Pre School. Both my sons have loved it. It has a welcoming, fun and stimulating environment - After all how many Pre School's have their own farm animals? The staff are lovely too - so friendly caring and nurturing. As a parent I always feel welcome. I couldn't be happier! I have been so happy with my daughters experience at Jacaranda Grove. The staff are so welcoming and have been so caring and nurturing towards my daughter. Josie loves the Pre School farm, garden and play area and she has learn't so much from the Pre School programme. Jacaranda Grove is an impressive Pre School and my daughter has loved it. This has been our first year at Jacaranda Grove and we'd recommend it to anyone. The staff are friendly and always approachable. The facilities are fantastic and you can see your fees going back into the centre to make it better for our children, it's a shame we can only stay two years! Attending Jacaranda Grove is the first step in my childrens journey of wanting to learn about themselves and what their strengths are. The opportunities to develop their creative mind, to test their physical ability or expand their curiosity of nature is offered to them in a very safe, caring and highly professional environment. The children leave the centre with a great deal of confidence making them ' school ready. I would recommend Jacaranda Grove to anyone. Our children have attended Jacaranda for the past seven years and we have felt so lucky to have such a wonderful preschool close by. We have always found the staff incredibly approachable and friendly and so good at what they do! They seem to have an endless supply of new ideas for activities for the children and while there is a clear daily routine it seems no two days are ever the same- my son always seems to have something special to tell us at the end of each day.